The name does not ring a bell. Does it? 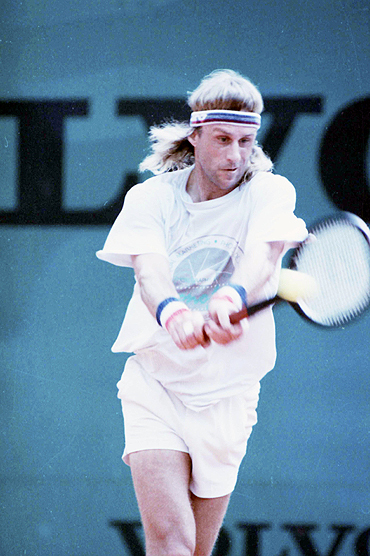 If we put the name of Bjorn Borg alongside, does it make any easier? So, let's just make things easier and establish a connection between the two. Shafei is one of the only four players to have beaten the legendary Swede at Wimbledon (see next page) and one of the many players who is best remembered for a particular upset. Remember an unheralded Australian Peter Doohan upsetting two-time defending champion Boris Becker in the second round at Wimbledon in 1987? El Shafei's is a similar result. For Borg, a winner of five successive titles at the All England Club, the venue was more about triumphs than disappointments. On the nine occasions he featured in the tournament, the Swede won a whopping 51 of his 55 matches. And that makes El Shafei's win a memorable one, even though it came at a time when the Swede's pro career was still a fledgling one. No wonder a wide grin surfaces on the Egyptian's face the moment you mention the match. "Yes, that was in 1974, on Court 1, and I won it in straight sets (6-2, 6-3, 6-1)," he says, remembering every distinct detail. 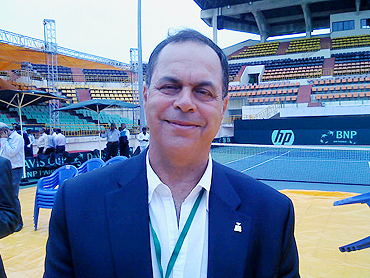 "It is a good memory," he adds El Shafei, now a board member of the International Tennis Federation (ITF) and in Chennai to oversee the Davis Cup World Group play-off tie between India and Brazil. Considering the fact that Borg had already made a breakthrough on the international circuit, he was one of the favourites going into the tournament. "He had just won in Rome (Italian Open) and at the French Open coming into Wimbledon and was a dark horse for that tournament," remembers El Shafei, adding that it was actually the grass surface that worked to his advantage that day -- and hastened the Swede's exit. "He wasn't really ready to play on grass at the time," explains the Egyptian. "Grass is a very fast surface that needs a more attacking game and he was not used to it then. "Consequently, I had a big game, a left-handed serve and a good volley. I was able to take charge of the game early and went on to win the match," he adds. El Shafei himself was no stranger to the All England Club though, having won the boys' singles title in 1964 and making it to the final on another occasion. The Egyptian followed up his upset of Borg with yet another minor upset -- over a much higher-ranked Manuel Orantes in the pre-quarters. He eventually came up short against former champion Stan Smith in the last eight. Nonetheless, it was his best ever effort in a major. And it is the win over Borg that El Shafei cherishes the most. "It is definitely a very good memory to keep as far as my tennis career is concerned," he admits. Considering the Swede was still climbing the ranks at that point, did he expect Borg to achieve the greatness he eventually did? "Of course, it looked like he had the potential," says El Shafei, before revealing what surprised him most about Borg's growth as a player in the following years. "The one thing he managed to do that nobody believed he could was to win five Wimbledon titles in a row," says the 63-year-old Egyptian. "Everyone thought that he is the greatest player on clay but nobody thought that he was as good on grass," adds El Shafei. Two years after his defeat at the hands of the Egyptian, Borg managed to lay his hands on the coveted trophy for the first time. The Swede would go on to win the titles in the subsequent four years as well. For the record, Borg eventually had his revenge, beating El Shafei 6-3, 6-4, 6-4 in the opening round of the 1980 edition, en route to his fifth and final Wimbledon title.